Let’s start with the issue that got me thinking. We have started using Clover to measure code coverage of our tests, and the first take on a standardised POM file for building a set of new components led to some weird things happening. Such as executing the ‘javadoc:jar’ goal 12 times in a single build, and so on. I never figured out exactly how that happened, but I managed to track the problem down to the fact that the Clover2 plugin calls the ‘install’ phase before executing itself. Although I think that is a less than great thing to do, there’s probably a good reason why it needs to ensure that ‘install’ has been executed, and I don’t want to spend time on that particular issue. What’s interesting is that this is a symptom of a design flaw in Maven. Maven allows and almost encourages plugins to be aware of and manipulate the build in its entirety – by registering themselves with a specific lifecycle phase, by letting them pull information out of the global project structure and like in this case, by allowing them to manipulate the build flow. This reaching out of one’s own space into a global space, where an object makes assumptions about what the world surrounding it looks like, is what I mean by the ‘complement of encapsulation’. An object that makes no such assumptions and does no such reaching out is self-sufficient. Encapsulation – it’s probably incorrect to think of self-sufficiency as the complement of encapsulation. They’re certainly not each other’s opposites, and encapsulation isn’t enough to guarantee self-sufficiency. It is perfectly possible that in the Maven example above, there is a well-encapsulated object that manages the build cycle, which the plugin is calling. The concept of encapsulation is applicable at an object or class level, whereas the concept of self-sufficiency is more of an architectural concept – what kind of interactions you decide to allow between which (sets of) objects. Dependency injection – one of the main points of dependency injection or inversion of control is that it encourages and enables self-sufficiency. Without it, objects always reach out into the surrounding world, making assumptions about what they will be able to find. But again, like encapsulation, DI works at a different level, and is not quite sufficient to get self-sufficiency. Side effects – there are many different definitions of side effects, but with all I’ve seen, the concept of self-sufficiency is related but not identical. Side effects are usually considered be “something that I didn’t expect a method with name X to do”. 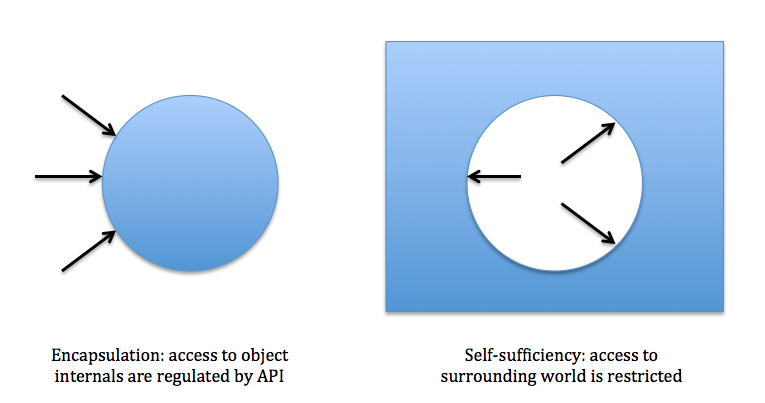 It’s possible and not uncommon to have objects that are not self-sufficient but are side-effect-free. Coupling – as I interpret the wikipedia definition, I would say that in order for a system to be loosely coupled, it must have self-sufficient objects. However, having self-sufficient objects isn’t enough to guarantee loose coupling – the most common application of the term relates to lower-level coupling between classes, making it harder or easier to swap in and out concrete implementations of collaborators. You can have self-sufficient objects that are strongly coupled to specific implementations of their collaborating objects rather than interfaces. Law of Demeter – an object that violates the Law of Demeter is less self-sufficient than one that follows it. But again, the Law of Demeter is more of a class/object design principle, and the principle of self-sufficiency is an architectural one. You can violate the principle of self-sufficiency while keeping strictly to the Law of Demeter. Layering – this is very closely related. Violating the principle of self-sufficiency means you’re bridging abstraction layers. Ideally, a Maven plugin should be at a layer below the main build itself (or above, depending on which direction you prefer – in this discussion, I’m saying lower layers cannot call up into higher layers). The main build should provide the plugin with everything it needs, and the plugin should execute in isolation and without worrying about what happens above it. Self-sufficiency is a narrower and slightly different concept than layering. It has opinions on where the layer boundaries should be located. In the Maven example, there is no abstraction layer between the build as a whole and the plugins, and self-sufficiency states that there should have been one. Isolation – objects that are self-sufficient can be executed in isolation, independently of the context they’re running in. However, isolation would be overloaded (with primarily the I in ACID), and it’s also a little negative. I think the term should be positively charged, as the concept represents a good thing. Introvert/Extrovert – an Extrovert object reaches out into the world and makes assumptions about it whereas an Introvert one has all it needs internally. The good thing about this pair is that it is a pair. The world in-self-sufficient doesn’t work, and neither does self-insufficient. But again, the way these terms are usually used, it’s better to be an extrovert than an introvert, which is the opposite of what the term should mean in this context. If I ever do find the time to try to fix Maven, one of the things I’ll do is make sure plugins are self-sufficient – let the overall build flow be controlled in its entirety by one layer, and let the plugins execute in another layer, in complete ignorance of other plugins and phases of the build!